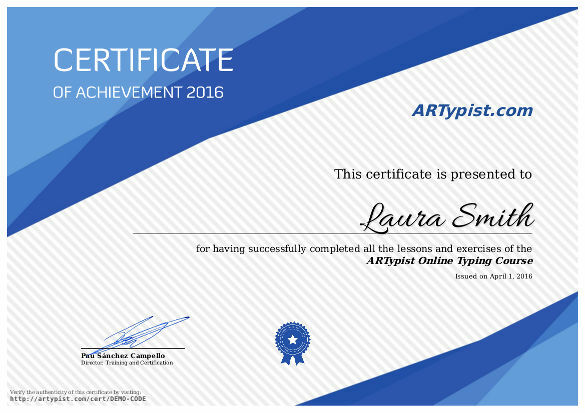 Complete all the lessons and exercises of ARTypist typing tutor to get a certificate. In order to issue the certificate you will need to complete all lessons and exercises as a registered member of ARTypist website, either by using your Facebook account or your e-mail, so we can keep track of your progress. You will be able to download ARTypist Online Typing Course Certificate as a PDF file that can be accessed and viewed using any device. Print your certificate at home or share it with recruiters. A security code is added to each certificate that we issue so anyone with a copy, either in digital or printed format, can validate its authenticity.